Ever since I found the Unfuck Your Habitat Tumblr, I've been addicted to its brand of frank, compassionate, sweary advice for people who want to be organized but don't know where to start. Now, unfucker-in-chief Rachel Hoffman has distilled the UFyH philosophy into a brilliant, breezy book that is a must-read for people who are terrified by Marie Kondo but intrigued by being able to see their floors again: Unf*ck Your Habitat: You're Better Than Your Mess. Hoffman's core thesis is that no one automatically knows how to keep house, and a lot of the assumptions about housekeeping -- that it is done by an able-bodied, full-time home-maker in a single-family home -- are totally inapplicable in the twenty-first century. They're sexist, outmoded, and unrealistic, and they lead to the shaming of economically precarious people, they exacerbate the trauma of mental illness, and they let men pretend to be helpless babies who can't clean up after themselves, but should be heaped with praise just for trying. Her remedy for this dismal situation is to take small, regular, incremental steps that will turn into good habits ("put it away, not down") while being kind and compassionate with yourself and the people around you. Hoffman strikes a delicate balance between frankness ("excuses are boring") and understanding, with frequent exhortations to self-care and empathy for others. The Unfuck Your Habitat method involves a lot of quick-and-dirty (!) tricks for making things cleaner and cleaner-feeling; for example, Hoffman advises making your bed promptly in the morning, because it makes your bedroom 20% cleaner in five minutes and gives you a sense of accomplishment that can propel you into more substantial cleaning. She also reminds us that doing the dishes has three steps: clean, dry, and put away. Anything less is just a mess for your future self (same goes for laundry: wash, dry, put away). 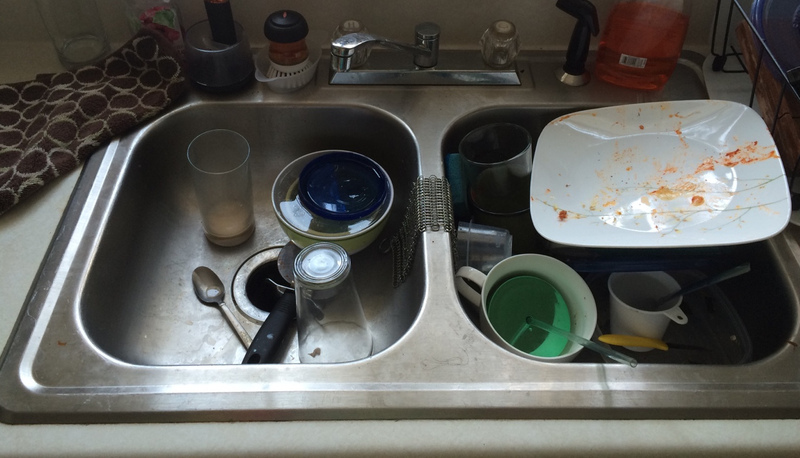 The Hoffman method is firmly embedded in social contexts: tidying and cleaning as something that has to be solved between friends, lovers, families, roommates, dormmates, even tenants and landlords. Accordingly, a lot of this book is taken up with how to resolve the fights that cleaning always generates, in a mix of cleaning advice and relationship advice. Here, Hoffman's compassion for the mess-makers really shines, pivoting to offer compassion to everyone in the mess landscape: tidiers, messers, worried lookers-on (there's a whole chapter on how to ask your friends to help with your terminal, helpless messes; and how to be a good friend to someone who makes such a request of you). I am not a tidy person by default -- this surprises people who know me, because I am generally a neatnik and have a tendency to walk around the house tidying others' messes and muttering. But the reason I put so much work into cleaning up is that if I don't do it as a conscious effort, I quickly end up in hopeless messes (catch me when I'm exhausted and watch the detritus fly) I recognized a lot of my coping strategies in UFyH, but there was still plenty for me to learn here. I was especially taken by Hoffman's exhortation to force yourself to take short breaks while you work: her basic unit of cleaning is the "20/10" -- 20 minutes of cleaning followed by 10 minutes of vegging out, dancing, reading, or otherwise celebrating your accomplishments. The rest is not optional: if you don't have 30 minutes to give to cleaning, then do a 15/7, or a 10/5, or a 2/1. I've been tinkering with doing this and finding myself in much better spirits. Moreover, it's been an enormous success with my 8 year old: rather than fighting for 10 minutes at bedtime about cleaning up enough of her room so that she can actually find the bed, we do a 1/2 sprint: one minute of joint cleaning, and a two-minute dance party. It works every time.